My wife Gillie and I thoroughly enjoyed our 16 day trip to China, booked through the Travel Wallet in Bridgnorth, Shropshire. We’ve booked with the Travel Wallet several times and have always had excellent service. We’d encourage others to consider this trip…China is fascinating …the people are very friendly and welcoming. The “Wonders of China” tour was organised by Wendy Woo Tours, took in many of the major locations, including the Beijing, the Great Wall, X’ian for the Terracotta Warriors and Shanghai. But one of the highlights was a four night cruise along the Yangtze river which included stunning scenery. Wendy Woo Tours seems to be enjoying much success in China as the company’s owner, Wendy Woo, co-hosted a major cultural event with the regional tourist authority in X’ian, home to the nearby Terracotta Warriors. The Wendy Woo guides (especially the national guide, Melody) were all excellent and couldn’t be more helpful. 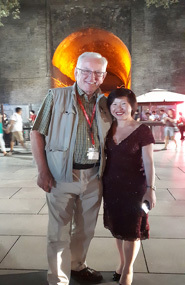 Picture shows Wendy Woo at the cultural event with Chris Aked, one of her customers from Bridgnorth, Shropshire.